Australian Financial Review Loses Its Mind Over #HESTADivest. Why would that be? On what grounds? It has none. Lots of sniping, much incoherence. The AFR have really put on the clown-shoes for this one and done a few laps for our amusement. compulsory superannuation’s purpose: to maximise retirement incomes rather than subsidise political activism. Firstly, if a newspaper dedicated to covering financial issues cannot work out that divestment does not mean subsidising something, they might want to work in a field that does not involve having to add or subtract. The suggestion that retirement funds are subsidising anything remotely like “political activism” by not loaning members’ money to Transfield Services is either consciously pernicious misdirection or delusional. That money will presumably be invested in another industry. And if the AFR‘s editors do not understand how investment markets work, they are unfit to be editing a financial newspaper. The value of Transfield Services’ shares has declined dramatically. 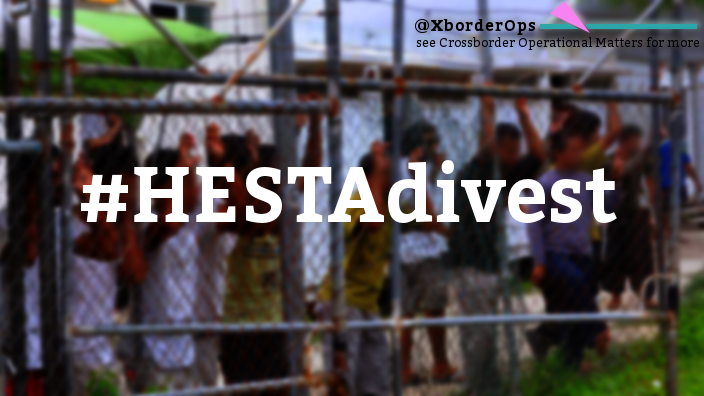 It has been on a slide since Transfield signed the contract to run Nauru. As for more recently: HESTA members’ lost money during the time millions of dollars of their retirement savings were invested in Transfield Services. [see graph below] HESTA’s investments did not maximise, they headed the other way. That decline is a result of many factors of course, but a huge one is the financial risk and instability of the detention industry itself. That is an ongoing matter. Clearly, the AFR do not understand the concept of prudential investments. Thirdly, the purpose of compulsory superannuation funds is not to provide a mountain of cash that should be compulsorily invested in a particular industry or company. If the AFR wants to make a case for compulsory investment in mandatory detention, perhaps they should make this to their friends at the Stock Exchange? Where’s your market liberalism now, huh? Finally, the AFR is owned by Fairfax Media. Fairfax Media regularly runs puff pieces for Transfield Services. And, the last time we checked, the second-largest shareholder in Fairfax Media is Allan Gray. The largest shareholder in Transfield Services is Allan Gray. Allan Gray are an investment management company which manages billions in assets. It originated in South Africa, but is now registered in Bermuda. Many of its assets are superannuation funds – including funds like Australian industry super funds. 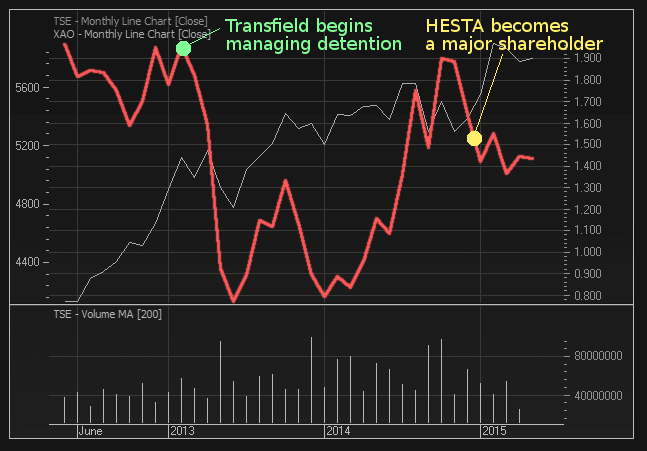 HESTA’s becoming a major shareholder in Transfield Services coincides with the the Belgiorno-Nettis family’s complete divestment from Transfield Services. HESTA members’ retirement savings were squandered to pull Transfield Services out of a hole after the Belgiorno-Nettis family decided to divest. Don’t recall the AFR editorialising against that divestment? It didn’t happen. But they’re happy to lecture super funds. If Allan Gray are insisting that superannuation funds should continue to invest in an industry whose value has declined significantly, it is not us who are insisting that super funds should be subsidising something but them. In this case, the subsidisation of abuse. HESTA should finally be congratulated for getting out. Other superannuation funds should follow suit. The detention industry is toxic on every level. Divest.